The All New, All Daring Delusional Honesty! : What? No INCREDIBLE HULK #650 in 2012? Greg Pak’s biggest story yet, “Heart Of The Monster”, brings dire consequences to the Green Goliath and those close to him. What happens when the furious monster inside Bruce Banner says, “ENOUGH”? The writer of Planet Hulk and World War Hulk brings his critically acclaimed Incredible Hulks run to a close…with a SMASH. Catch the oversized final issue of the long running series, with a monster sized story and dozens of extras celebrating Greg Pak’s run, that no fan of the Jade Giant can miss. So, what's in the future for the ever-incredible Hulk? Will Thad Ross be the only Hulk with a title to call his own? What extras are we talking about in this issue aside from the multiple variant covers and that blank cover you can bet I'll be taking to conventions? Any extra backup stories inside? How big will the issue in question be? And might there be one final enemy beyond Fin Fang Foom, one long rumored to return? Mmmmmmmaybe? One thing I'm relatively certain of is that once again, we're going to get a senseless renumbering of the series when it's on the cusp of a terrific anniversary number (#650, which if keeping the current schedule, would've been available just in time for the character's 50th anniversary next year). What it would also mean is, unless things change, the Red Hulk title will outnumber the title of the character from whom he spun off, and that's rather backwards. So, is there a sea change in store for Red Hulk, too? Darn it. I waited 10 years for this series to resume its rightful numbering. I petitioned Alonso (ha! ), Breevort and finally Mark Paniccia: And now within 24 months, its gone again. And probably for good. Do we really think Marvel will be renumbering back to #700 in 70 odd months? That is (what with trades and digital) if they are still publishing magazines by then... So disappointed. Interesting. I'm also wondering if there is another foe, one that could be even more powerful than those revealed. The only being that I can imagine being more powerful than any of those listed would be that of Zeus, who might have another confrontation with our Green Goliath. I can only hope that Greg Pak gives us an awesome finale. It also makes me wonder if Pak or some other writer will have a Skaar series, which would be awesome, because I really don't care for Red Hulk. I also wouldn't mind a She-Hulk series involving Jen & Lyra. I agree with you that it's really stupid that we're most likely going to get a renumbering of the series. 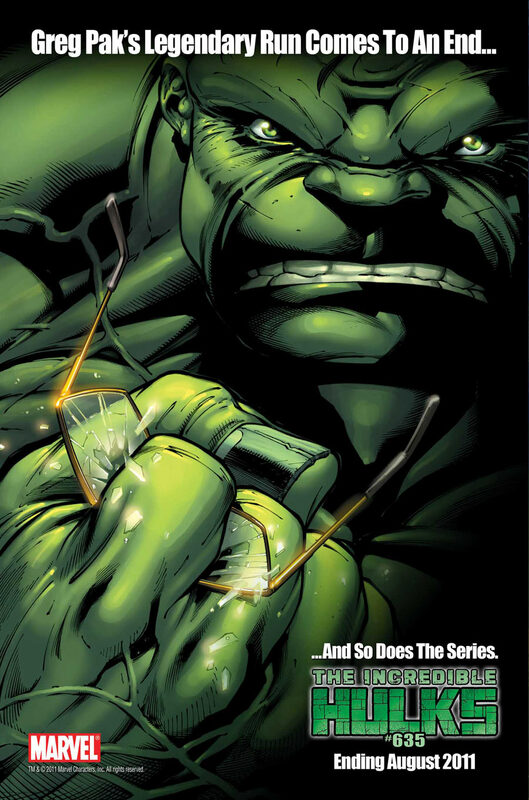 I'm still curious to see who'll be the next writer for Incredible Hulk... if there is any. Regardless, I can't wait for Incredible Hulk: Heart of the Monster. Gary,do you think they might temporarily put the title on hiatus for a few months? Sort of like what they did when World War Hulk ended. Then maybe a few months down the road it would be restarted? I agree with you that it would be silly to do either while still keeping the Red Hulk's title going. But that is what they did before when Loeb's title replaced the regular one along with Skaar's title. What do you think? Everyone, I have started to answer some of these questions in the newest blog post. Thought it was worth more than a casual reply. Thanks for reading!